The 100 gram Silver Valcambi CombiBar is an exquisitely crafted bar that offers detachable increments for smaller trades or to offer as gifts. Composed of 100 individually stamped .999 fine 1 gram bars, each 100 gram bar comes fully sealed and packaged with a certificate of authenticity. As one of the most liquid size of bullion, Valcambi branded products are traded globally in the precious metals market. 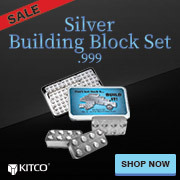 You can store your 100 x 1 g Silver Valcambi CombiBar safely and securely with Kitco Allocated Storage. Kitco offers you global options for gold, silver and platinum bullion storage that is fully segregated, insured and allocated. Kitco's network of top-tier vaults includes some of the most secure storage facilities in the world, in Canada, Hong Kong or the United States (COMEX approved). Cayman Islands storage is also available (certain conditions apply). Find out more about keeping your gold, silver and platinum purchases secure, with our Global Precious Metals Storage Solutions.